Renowned author, Stuart Williams, remembers intimate and humorous details of the ever-changing Paul Nelson Farm. He reveals Paul’s “Best Kept Secret” of December hunting. 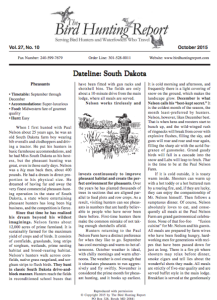 When I first hunted with Paul Nelson about 25 years ago, he was an old South Dakota farm boy wearing bib overalls and clodhoppers and driving a tractor. He put his hunters in basic farmhouse accommodations, and he had Miss South Dakota as his hostess, but the pheasant hunting was great, even in those early days. Nelson was a big man back then, about 400 pounds. He had a dream in direct proportion to his physical size. He dreamed of having far and away the very finest commercial pheasant-hunting operation in the state of South Dakota, a state where entertaining pheasant hunters has long been big business, and the competition is fierce. Since that time he has realized his dream beyond his wildest imaginings. Nelson farms about 12,000 acres of prime farmland. It is sustainably farmed for the maximum yield of crops and of birds. It consists of cornfields, grasslands, long strips of sorghum, wetlands, prime nesting habitat and brood-rearing habitat. 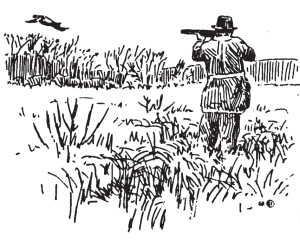 Nelson’s hunters walk across cornfields, native grass rangeland, and sorghum strips to flush birds. They hunt in classic South Dakota drive-andblock manner. Hunters reach the fields in reconditioned school buses that have been fitted with gun racks and shotshell bins. The fields are only about a 10-minute drive from the main lodge, where all meals are served. Nelson works tirelessly and invests continuously to improve pheasant habitat and create the perfect environment for pheasants. Over the years he has planted thousands of trees in sections that are aligned parallel to feed plots and row crops. As a result, visiting hunters can see pheasants in numbers that are hardly believable to people who have never been there before. First-time hunters there make the common mistake of not taking enough shotshells afield. Hunters returning to the Paul Nelson Farm have a distinct preference for when they like to go. September has cool mornings and warm-to-hot afternoons. October weather is ideal, with chilly mornings and warm afternoons. The weather is cool enough that it stimulates pheasants to run aggressively and fly swiftly. November is considered the prime month for pheasant hunting, and it books up earliest. It is cold morning and afternoon, and frequently there is a light covering of snow on the ground, which makes the landscape glow. December is what Nelson calls his “best-kept secret.” It is the coldest month of the season, the month least-preferred by hunters. Nelson, however, likes December best. 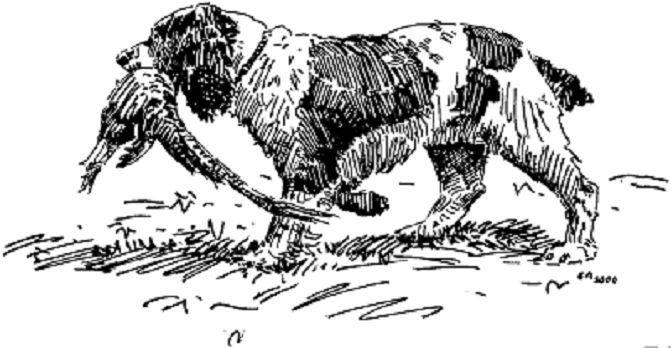 That is when hens and roosters start to bunch up, and the wild-winged rush of ringnecks will break from cover with explosive flushes, filling the sky, and guns will roar and roar and roar again, filling the sharp air with the acrid fragrance of gunsmoke. Grand gaudy birds will fall in a cascade into the snow and Labs will leap to fetch. That is the time to be at the Paul Nelson Farm. If it is cold outside, it is toasty warm inside. Shooters can warm up with a hot toddy or a hot buttered rum by a roaring fire, and, if they are lucky, they can enjoy the companionship of Mr. Nelson himself. Then follows a sumptuous dinner. Of course, Nelson absolutely loves to eat, and consequently all meals at the Paul Nelson Farm are grand gastronomical celebrations. None of that foo-foo “fusion cuisine” for Mr. Nelson and his guests. All meals are prepared by farm wives who have been feeding hungry, hardworking men for generations with recipes that have been passed down for just as long. There is a fire pit where shooters may relax before dinner, smoke cigars and tell lies about the wonderful shots they made. All meals are strictly of five-star quality and are served buffet style in the main lodge. Breakfast is served at the gentlemanly hour of 8 a.m. and starts out with coffee, muffins, toast, cereal and yogurt, then moves on to eggs prepared in several styles, with bacon, ham, oatmeal, biscuits and gravy. There is ample fare to fortify hunters for a long, cold morning afield. Lunch might offer several choices: fried chicken, chili, homemade soups, beef stew, Jessie’s famous meat loaf, sliced turkey and homemade desserts. Dinner, of course, is the main meal of the day. It always starts with hot hors d’oeuvres that showcase pheasant prepared in many different ways, which are followed by a variety of cheeses, shrimp, and taco dip and then the main course. This might be prime steaks, thick center-cut smoked pork chops, pheasant with wild rice, and, preeminently, the piece de resistance, Nelson’s nonpareil prime rib. Lunches and dinners are accompanied by wines of a rating of 90 or higher in Wine Spectator magazine. Guests may bring their own wines, which are stored separately from Nelson’s wines, in a wine cellar with a perfect temperature of 52 degrees. While guests are feasting on dinner, they enjoy a very special treat. Nelson’s wife, Cheryl, serenades them with beautiful melodies on her harp. The best word to describe the accommodations is opulent. Nelson is never satisfied with good enough or even excellent accommodations. Every several years he razes his complex of buildings and builds anew, ever bigger and better and more beautiful than the previous buildings. There is an emphasis on all-natural, locally sourced materials, such as huge, locally quarried stones in the fireplaces, exposed-beam ceilings, bisonhide rugs and coyote pelt chair covers. The overall impression is one of grandeur and magnificence. Of course, all this comes at a price, a rather high price. Costs are determined by group size. For a group of six or more, the cost is $5,295 per person; for five, $5,895; for four, $6,195; for three, $6,595; for two, $6,995; and for one, $7,595. 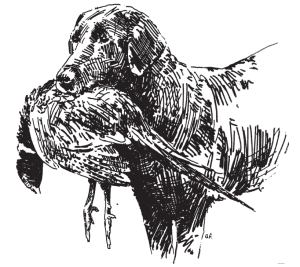 These rates include three full days of hunting, with five pheasants per day (additional birds are $49 each); the use of a 12-gauge overunder shotgun; unlimited ammunition; unlimited sporting clays; shooting instruction; all accommodations on a single room basis; all meals and wines; guides and dogs; cleaning and packing of birds for transport; and transfer from and back to the airport in Pierre. Accommodations in the superluxurious King Lodge cost an additional $1,200 per person. The great majority of Nelson’s business is corporate entertainment. To a great extent that explains how he can charge the prices that he charges. In spite of the very high prices, Nelson has a repeat booking rate of an incredible 98 percent. How can that be? There are other places that provide excellent food and wines and hunting and accommodations but do not enjoy nearly so high a rate of repeaters. Part of it has to do with the fact that the farm is a family-run organization. There is Nelson’s son, Eric and Eric’s wife, Tami, both of whom go out of their way to make hunters feel welcome. However, I think that it has largely to do with Nelson himself. He is a man of singular charm. People just really like him and want to be around him. I don’t know whether he has studied Dale Carnegie’s book, but he certainly knows how to win friends and influence people – and keep them coming back.